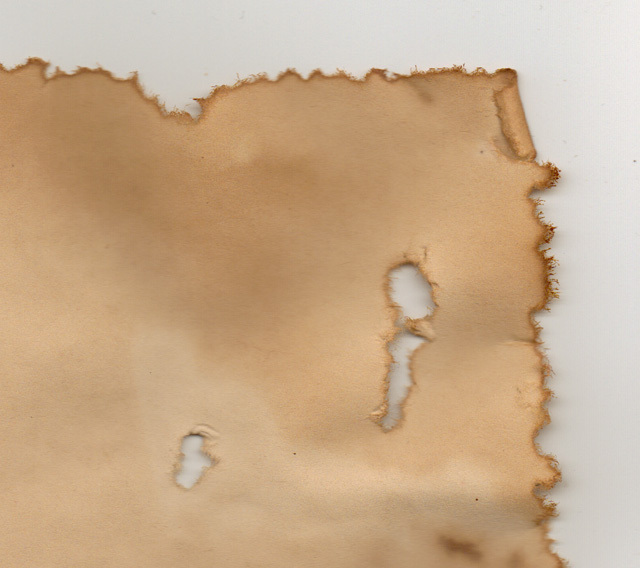 The basics of aging paper are absurdly simple- use tea to stain the fibers and allow the sheet to dry. Like many others, I learned that method in grade school and have been using it with minor variations for decades. It’s quick, it’s easy, and it does a reasonably good job of reproducing the browning and oxidation of old paper. 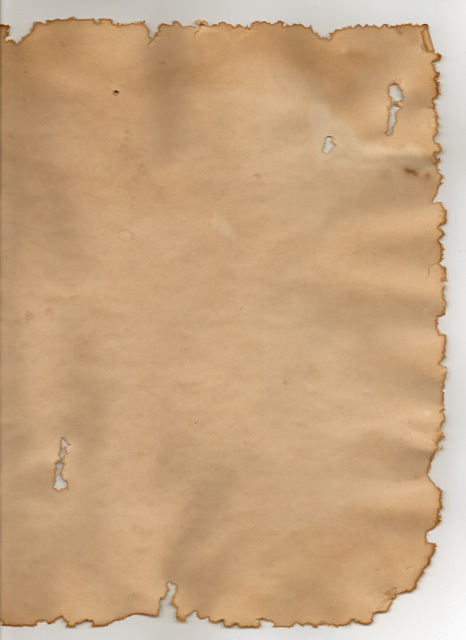 With some minor tweaks tea staining can also recreate the darkened edges found in old documents. While your sheet is still damp simply sponge more tea along the edges, allowing the paper fibers to soak up more of the tannic acid in the solution. In essence you’re accelerating the natural process of wicking that causes the edge discoloration/oxidation in real fiber papers and parchments. When trying to create the look of something truly old, like an ancient scroll, you also need to create the ragged edge produced when tiny fragments of paper break off over time. In the past I’ve used a deckling blade to produce that effect, but I think I’ve stumbled on a better method. Previously, I would rip the paper along the deckling blade to get a rough edge and then begin the staining process. Now I stain the paper, wait until it’s almost dry, and then use the sharpened end of a bamboo skewer to flake off bits of paper. Just press the point of the bamboo into the edge of the paper and tear off small pieces using a flicking motion. It sounds tedious, but once you get the hand motion down the process goes quickly. Here’s a look at the results using a standard sheet of printer paper. Just click through for a higher resolution version. The skewer technique produced a wonderful worn edge, and the exposed fibers soaked up another sponging of tea to create the darkened oxidation border of old paper. Here’s a closer look. I experimented with some internal wear and the results were generally good. The only thing I wasn’t happy with was the paper bunching seen along the edges of the wear spots, particularly the one slightly left of center. The fix for that is easy- once you’ve made your initial tear use the skewer tip to rip small flakes toward the center of the hole instead of ripping outward. This all might seem a bit picayune, but it’s the little details like this that help make a convincing prop. Live action props are the most difficult kind to create, more so than anything on stage or film, since they’re subjected to minute, detailed examination. Paying attention to the edge treatment not only produces something that looks more realistic, but feels more realistic.